One of the big trends that made itself prevalent on the European catwalks for this upcoming season was the floral pattern. Alexander McQueen, Gucci, Prada, Dries Van Noten and many other notable designers had some pretty bold floral designs that will surely creep into the mainstream in the year to come. The reason I’m focusing on this is that even though I don’t expect any of you to wear a floral shawl/blazer hybrid over floral cropped pants (Gucci), we can honor the trend on a smaller scale by incorporating it in the form of an accessory or just one piece of an outfit in the context of our day-to-day. For example, I plan on rocking my floral necktie (pictured below) often, but that’s probably going to be the extent of it! Nothing too fancy, but it’s a nice nod to what the European designers are doing and it’ll keep me ahead of the curve. 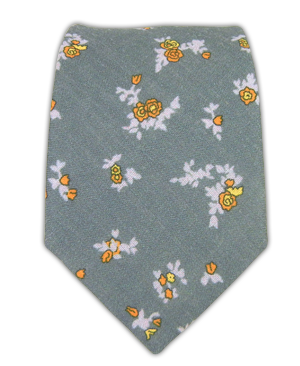 My recommendation would be to get one of these Linen Flower Ties at The Tie Bar. It’s an effortless way to step up your style game in an office or casual environment. If you want to be a little more bold though, I’d recommend a Floral Shirt that you can pair with a patternless bottom. Just note that since floral is such a strong pattern, you’re going to want to keep the patterns of the other pieces of your outfit relatively bland (I’m talking solids) to feature the floral and prevent clashing. Try Gitman Brothers for some rad shirts this season! of the finest blogs on the internet. I most certainly will recommend this blog!